This record was originally printed in The Rainwater Researcher, Vol. 2, Issue 3, April 1996. 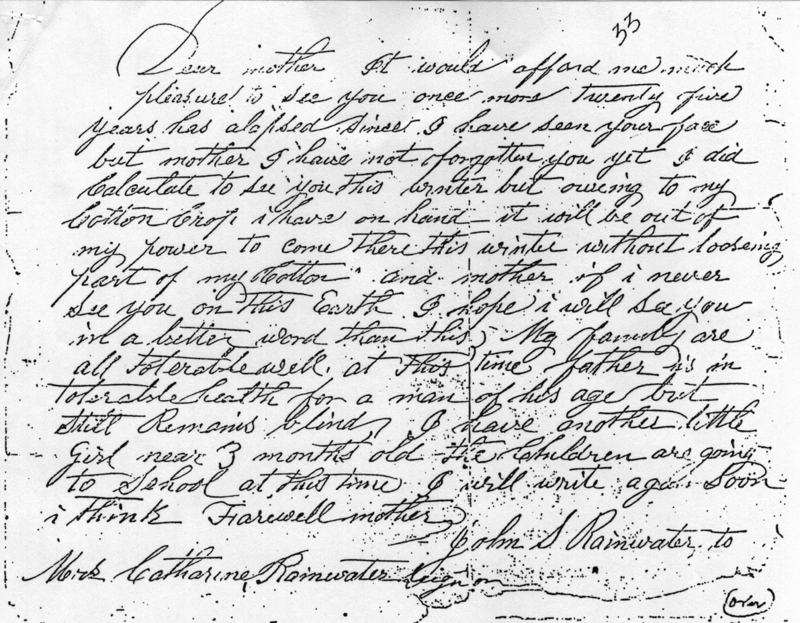 It is described as a letter kept in the Bible of Jacob Rainwater, written by Judge Clive Pettijohn, the son of Mary Catherine Rainwater Pettijohn, to his half-aunt, Jesse Rainwater Thompson. "James Rainwater died in Sevier Co., TN. He was born about 1780 and died about 1841. He was your great-grandfather, Jessie, my great-great grandfather. There may have been two more boys – (do you know if your Grandfather was married twice)? There was a Catherine Regan and a Sanderson – I think Mother said Sanderson was the name of your great-grandfather James’ 2nd wife. Maybe Catherine Regan 10 was one of his wives. She was either his or your Grandfather James’ 2nd (if he had a 2nd), I don’t know. I just know Catherine Regan belongs in somewhere. They lived in Sevier Co., Tenn. too." 5 Colton Baker. There is some degree of controversy over whether Catherine was a Rainwater or Kifer by birth. 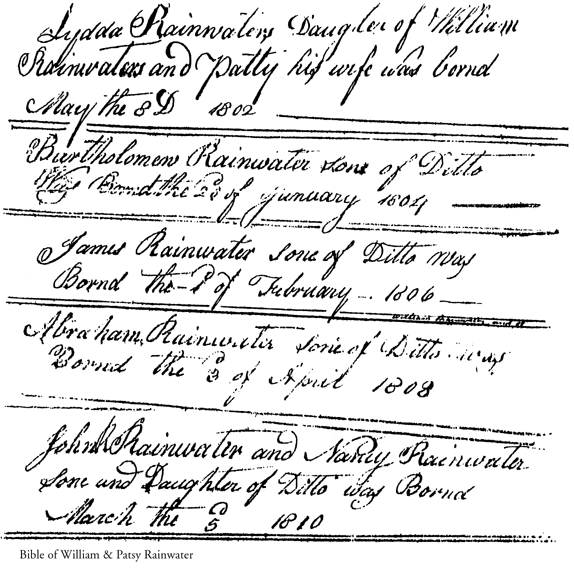 6 James Rainwater Jr.’s 2nd wife was Julia Jane Sanderson. 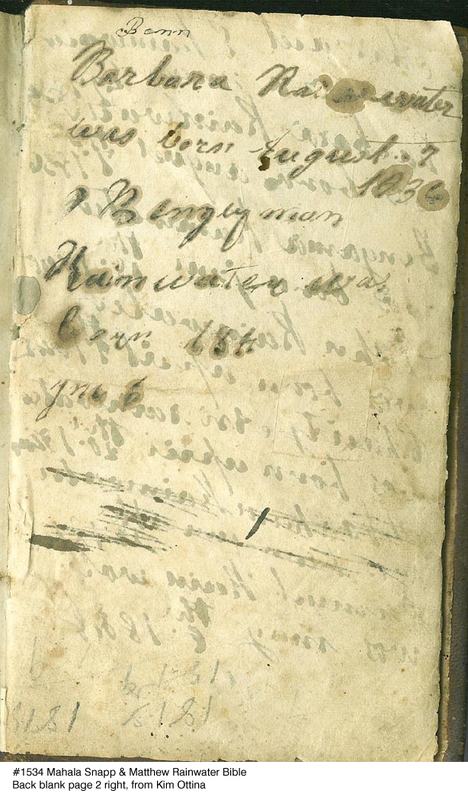 This Bible belonged to William Rainwater (ca 1774 Surry Co., NC - 1825 Pulaski Co., KY) and his wife, Martha "Patsy" Hodge (ca. 1781 North Carolina - bet. 1850-1860 Pulaski Co., KY). 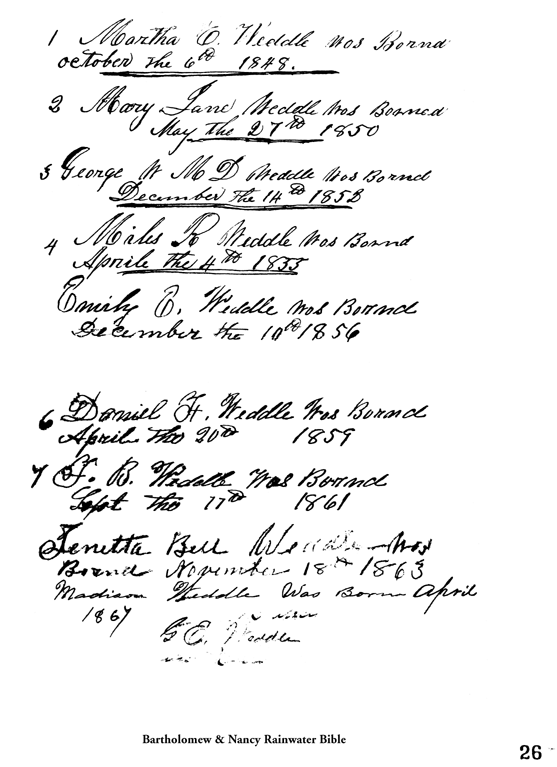 The transcription was made from photocopies given us by Frances Aderholt Smith. We have been unable to determine who, if anyone, presently owns this Bible. 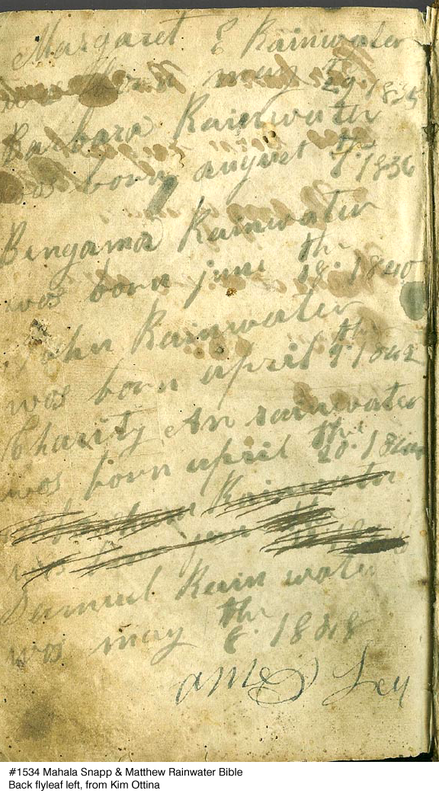 This Bible belonged to Bartholomew Rainwater (20 Jan 1804 Stokes Co., NC - 28 Jun 1889 Pulaski Co., KY) and his wife, Nancy McLaughlin (20 Aug 1807 Russell Co., KY - 20 Jan 1883 Pulaski Co., KY). 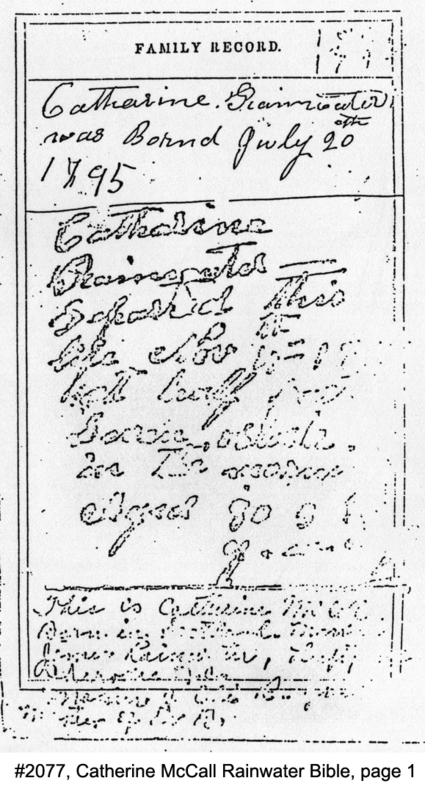 This transcription was made from photocopies obtained in the 1960s by Roscoe Rainwater, one of Bartholomew’s grandsons. We have been unable to determine who, if anyone, presently owns this Bible. 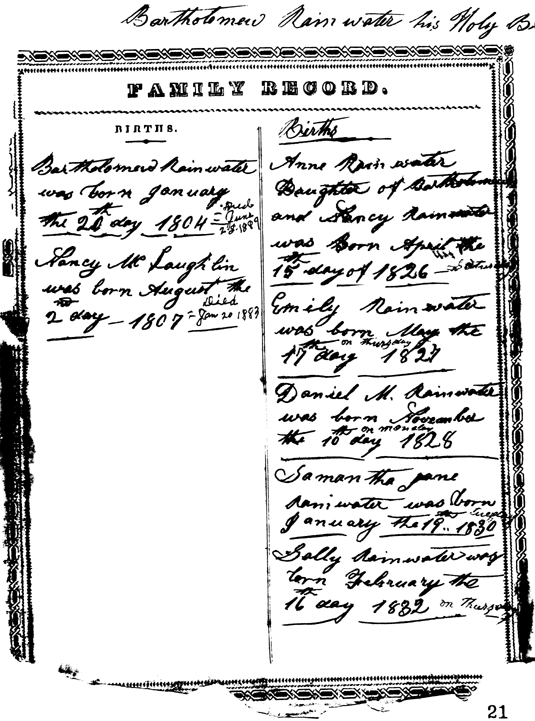 Anne Rainwater, daughter of Bartholomew and Nancy Rainwater, was born April the 15th day 1826 Saturday. Emily Rainwater was born May the 17th day 1827 Thursday. 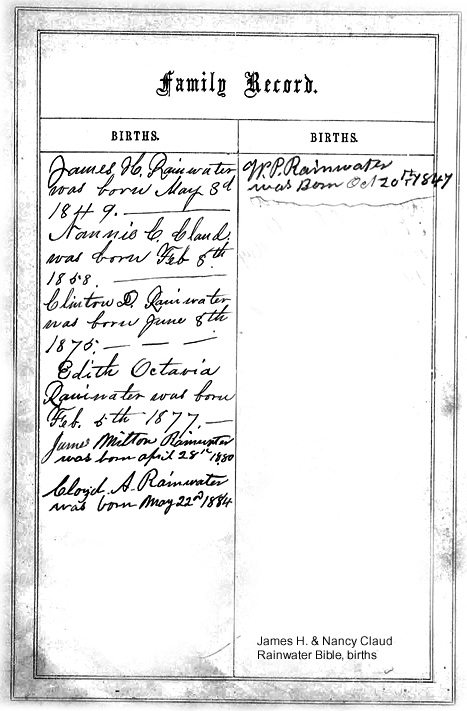 Daniel M. Rainwater was born November the 10th day 1828 on Monday. 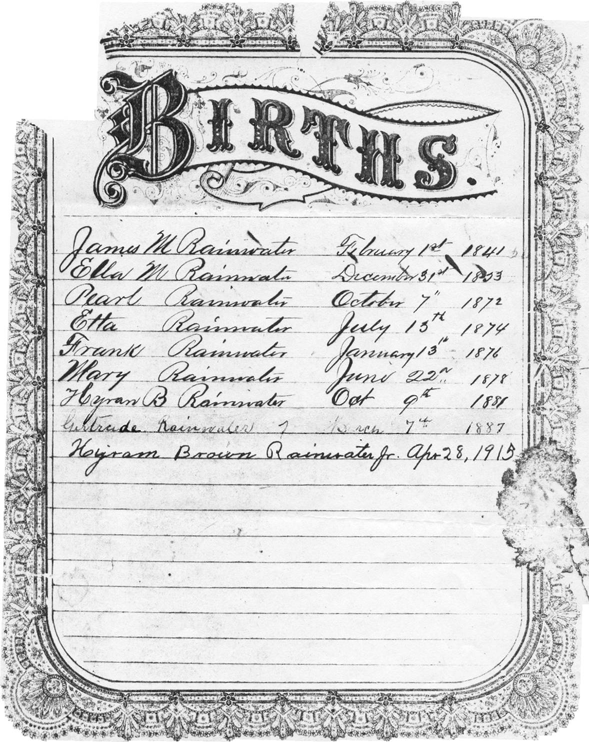 Samantha Jane Rainwater was born January the 19th 1830 Tuesday. Sally Rainwater was born February the 16th day 1832 on Thursday. 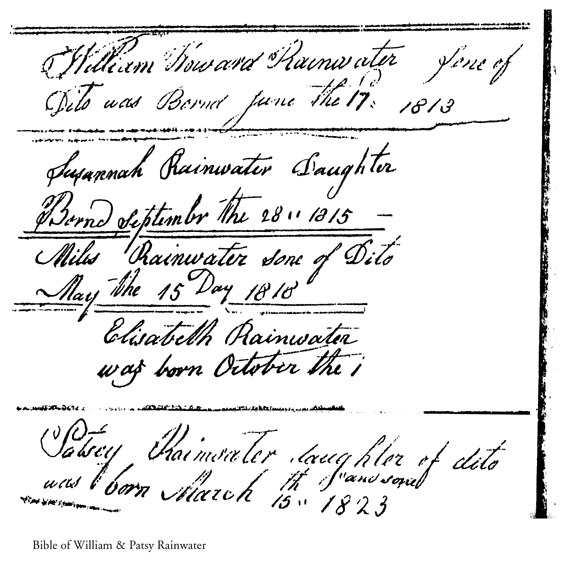 Susannah Rainwater was born February the 12th day 1834 on Tuesday. Two girls born and deceased March the 13th day 1835. Miles Rainwater was born April the 7th day 1836 on Friday. Polly Rainwater was born December the 28th day 1837 on Wednesday. 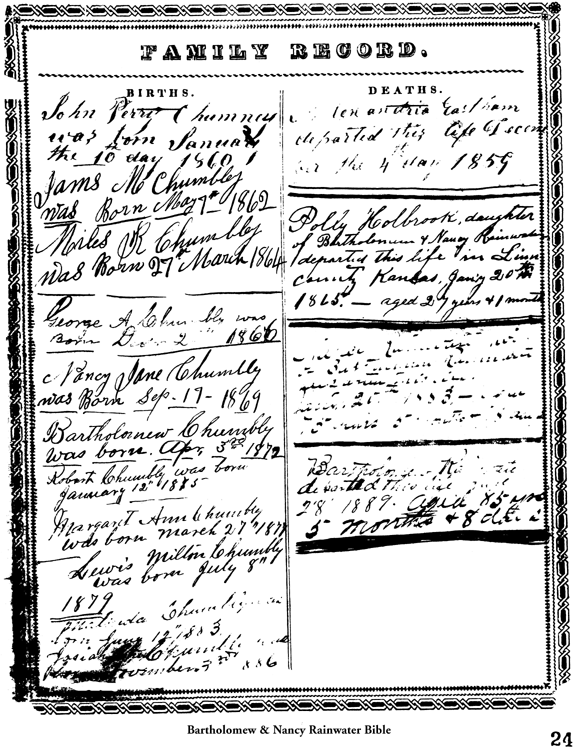 Ciota Rainwater was born December the 26th day 1839 on [unreadable]. 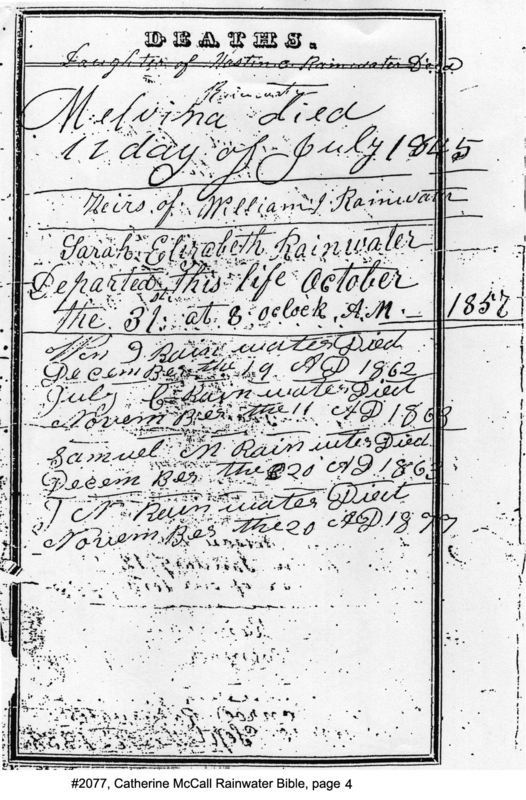 Sarelda Ann Rainwater was born December 9th day 1841 on [unreadable]. Josiah Wilson Rainwater was born October 10th day 1843 on Wednesday. 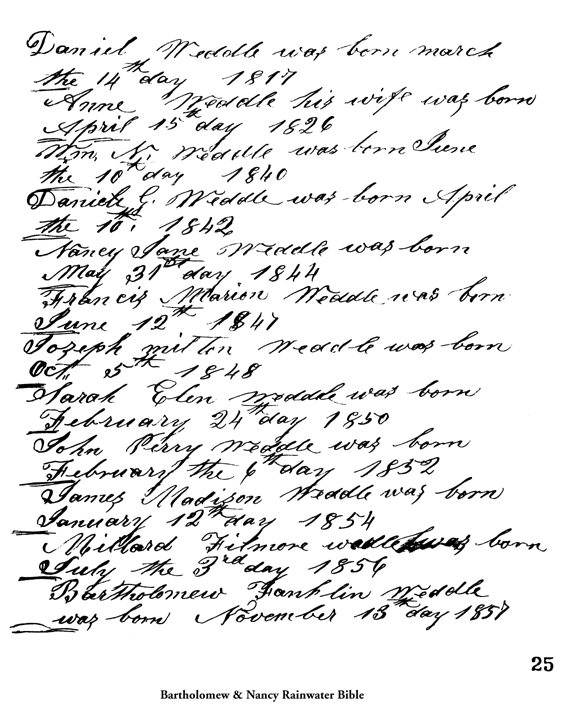 Galen E. Weddle was born May the 10 1829. Lucy Isadore Holbrook was born March 5 1860. Francis M. Holbrook was born July 14 1861. Nancy Belle Holbrook was born May 1st 1863. John Perry Chumbley was born January the 10th day 1860. James M. Chumbley was born May 7th 1862. Miles R. Chumbley was born 27 March 1864. George A. Chumbley was born Dec 2 1866. 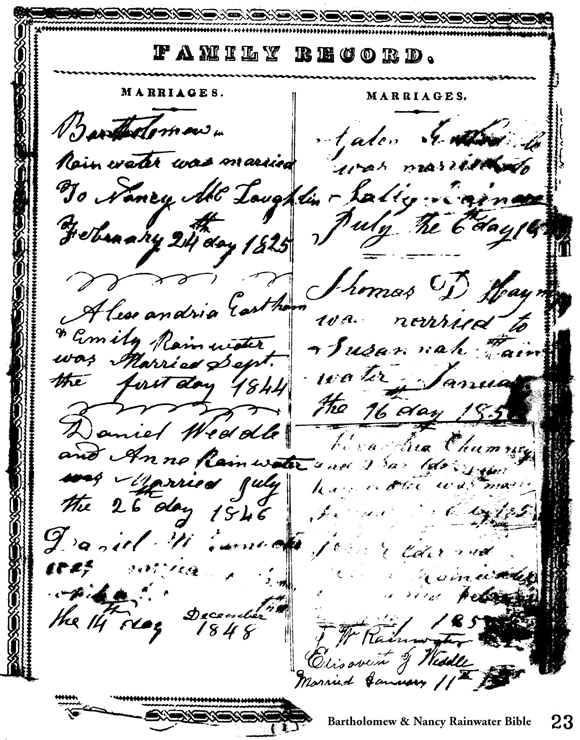 Bartholomew Rainwater was married to Nancy McLaughlin February 24th day 1825. 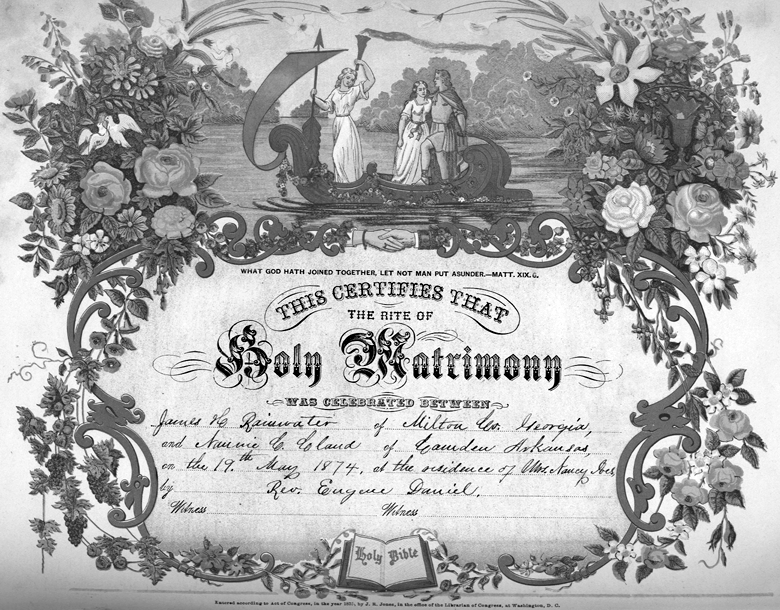 Alexandria Eastham and Emily Rainwater was married Sept the first day 1844. 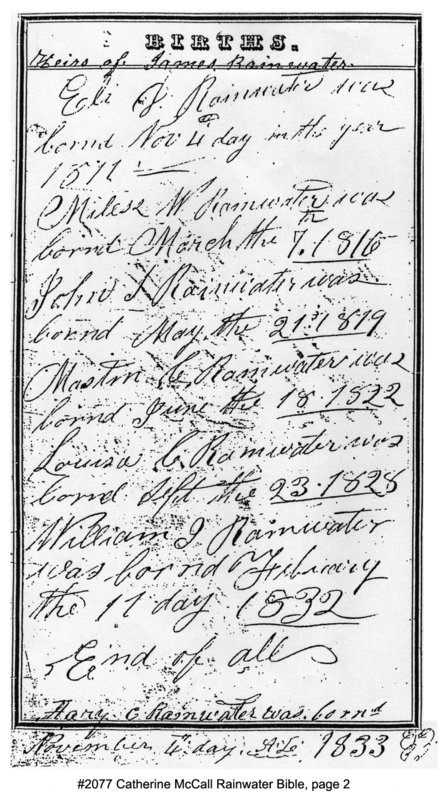 Daniel M. Rainwater [unreadable] December the 14th day 1848. 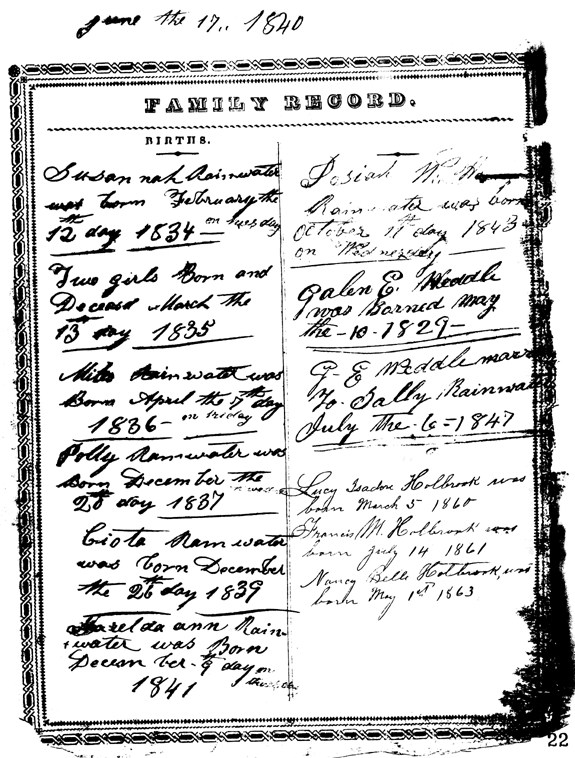 Galen E. Weddle was married to Sally Rainwater July the 6th day 1848. 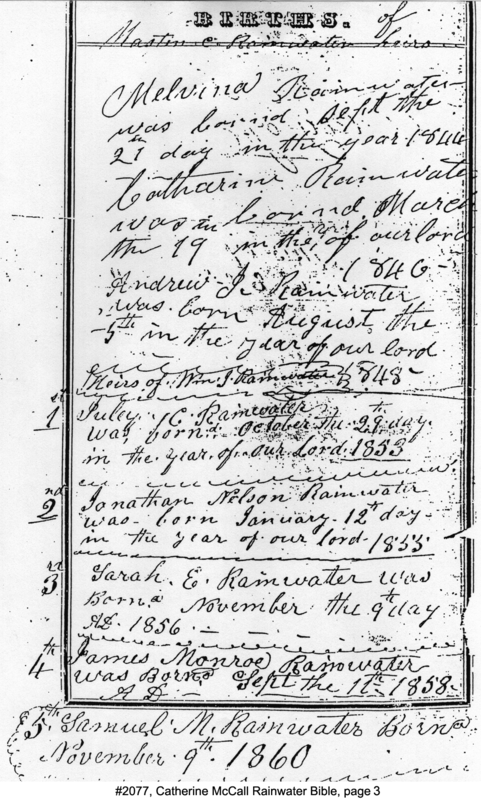 Thomas D. Hayney was married to Susannah Rainwater January the 16 day 1856. J.W. 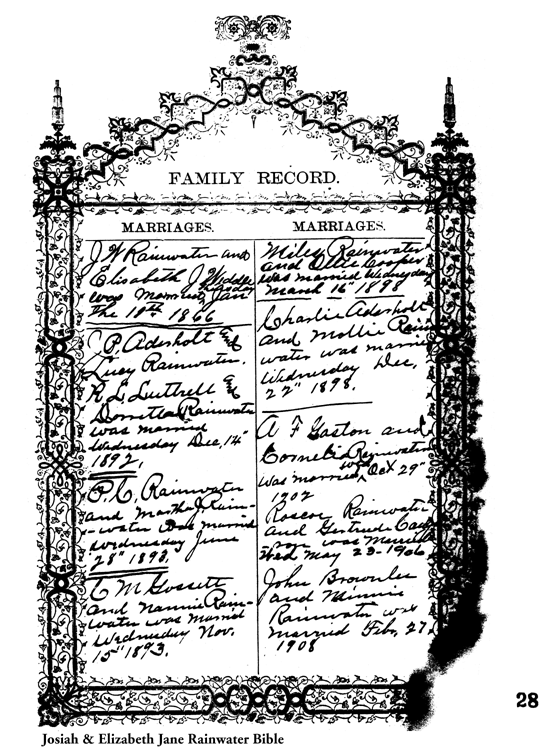 Rainwater and Elizabeth J. Weddle married January 11th 1856. 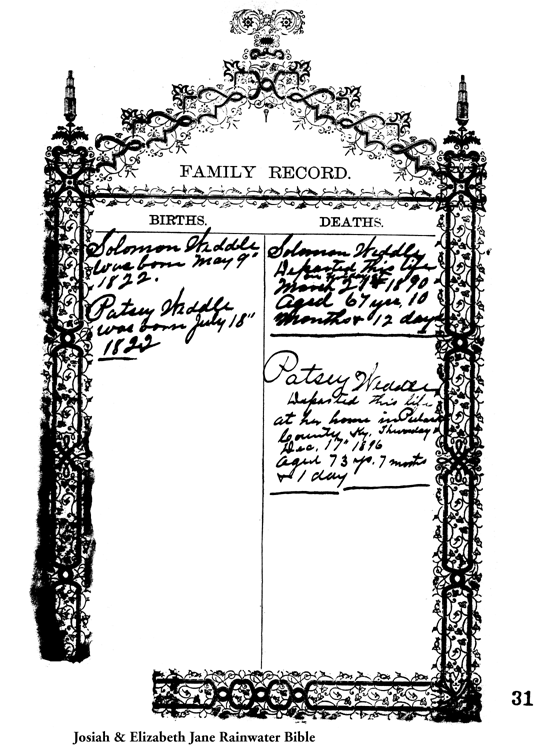 Polly Holbrook, daughter of Bartholomew and Nancy Rainwater, departed this life in Linn County, Kansas, January 20th 1865 - aged 27 years & 1 month. 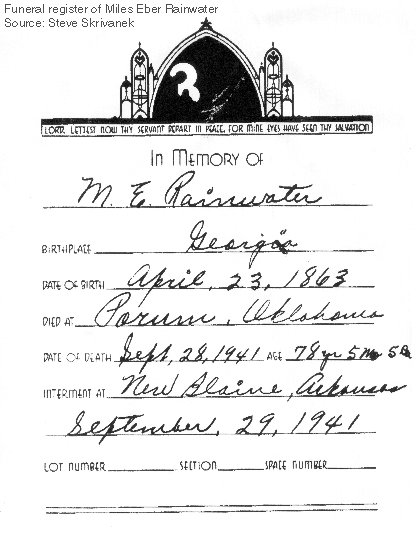 Bartholomew Rainwater departed this life June 28 1889, aged 85 years 5 months & 8 days. 1I was unable to decipher this entry, but Kelly Jurgeson proposed this reading of it and I think the available evidence suggests she is correct. 2 Children of Daniel Spencer Weddle and Anne Rainwater. The children born after 1860 are not listed in the Bible. 3Children of Galen E. Weddle and Sally Rainwater. 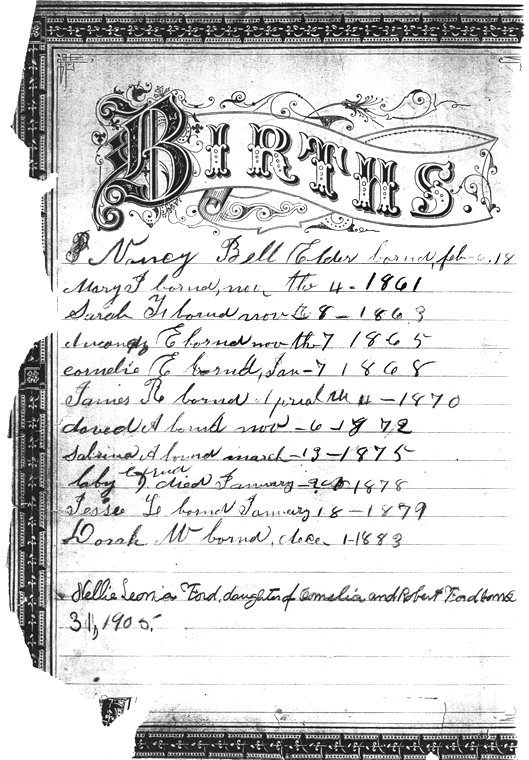 The children born after 1867 are not listed in the Bible. 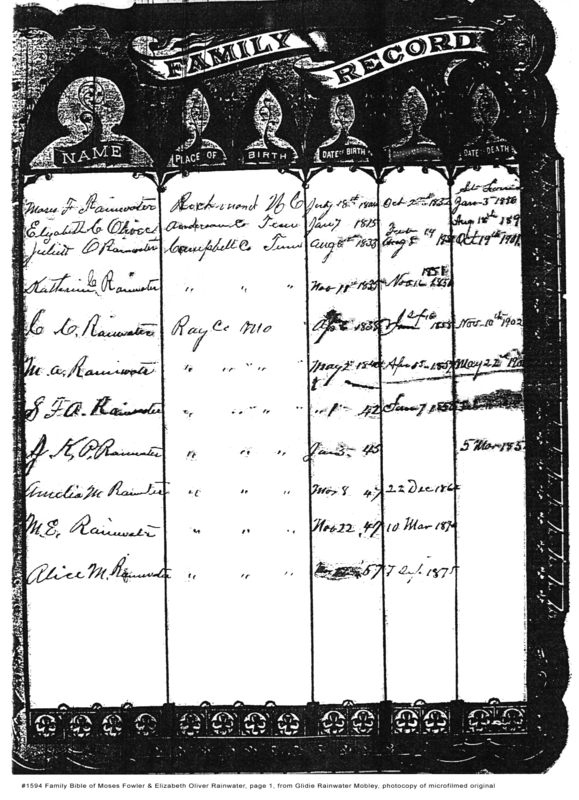 4Children of Alexandria Eastham and Emily Rainwater. 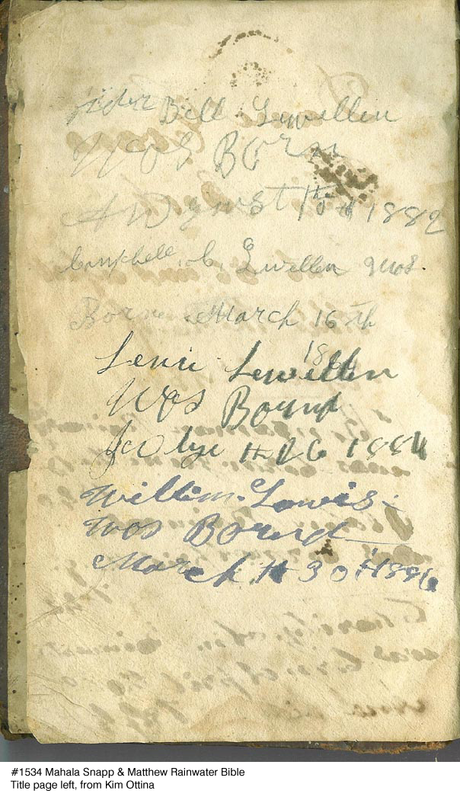 This Bible belonged to Josiah Wilson Rainwater (10 Oct 1843 Pulaski Co., KY - 16 May 1934 Wilbarger Co., TX) and his wife, Elizabeth Jane Weddle (7 Sep 1847 Pulaski Co., KY - 25 Jun 1943 Wilbarger Co., KY) This transcription was made from photocopies obtained in the 1960s by Roscoe Rainwater, one of Josiah’s sons. We have been unable to determine who, if anyone, presently owns this Bible. Patsy Weddle departed this life at home in Pulaski County, KY Thursday Dec 17 1896 - aged 73 years 7 months and 1 day. This scan was originally printed in The Rainwater Researcher, Volume 1, Issue 3, April 1995. I have no idea who presently owns this Bible. 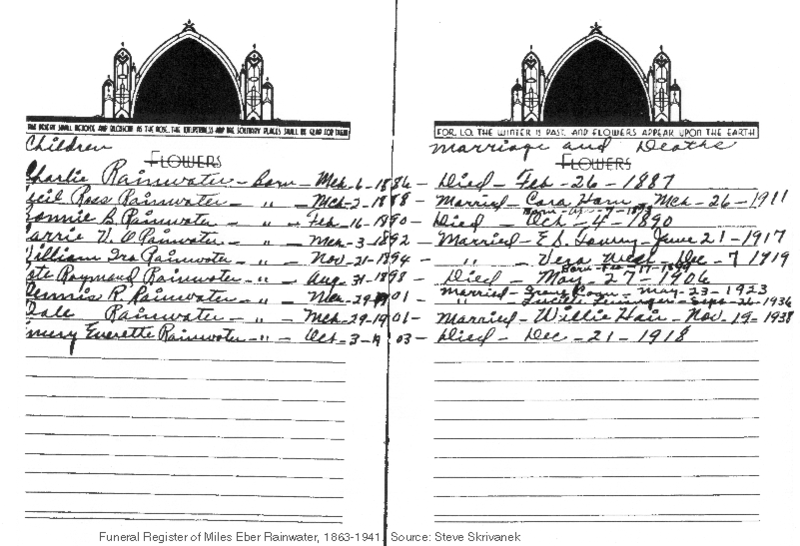 Joseph Judson Rainwater and Mabel Ruby Holland were married in San Antonio,Tex on 20 Nov 1918. Joe is Regimental Sargent Major. Lucy Rebecca Weems was born in Shubuta, Ms 20 Feb 1922. Married to Charles E.McLendon, Jr., born 17 Apr 1942 in Wash., D.C.
Josephine Klimowitz was born 31 July 1926 at Wilkes Barre, Pa.
Jo Ann Weems born 25 Mar 1950 at Wash., D.C. 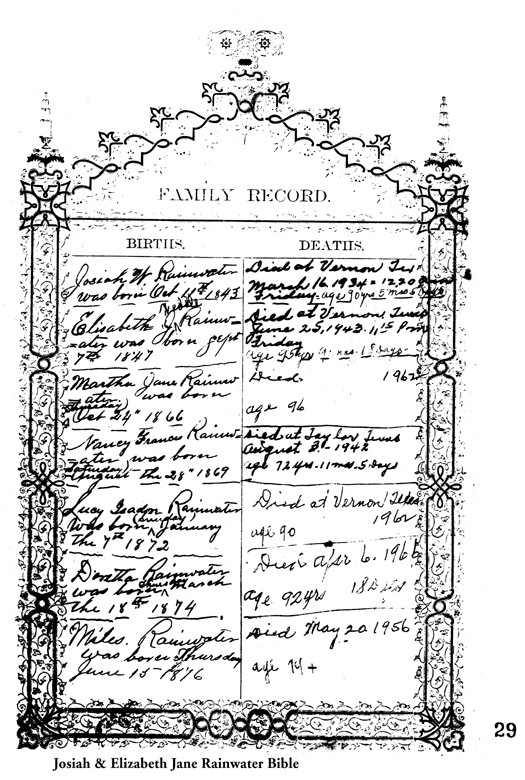 Birth of daughter, Juanita, 6 Aug 1922 to Robert Jennings and Eunice Smith Rainwater. Juanita Rainwater married Irwin Moshier 20th Dec 1941. Daughter, Eunice Helen Moshier, born 15 Sep 1943. Juanita and Irwin Moshier divorced Oct 1951. Juanita R. Moshier married John Words Buckner 25 Jan 1953 in Crossett, Ark. John W. Buckner was born 16 Dec 1908. 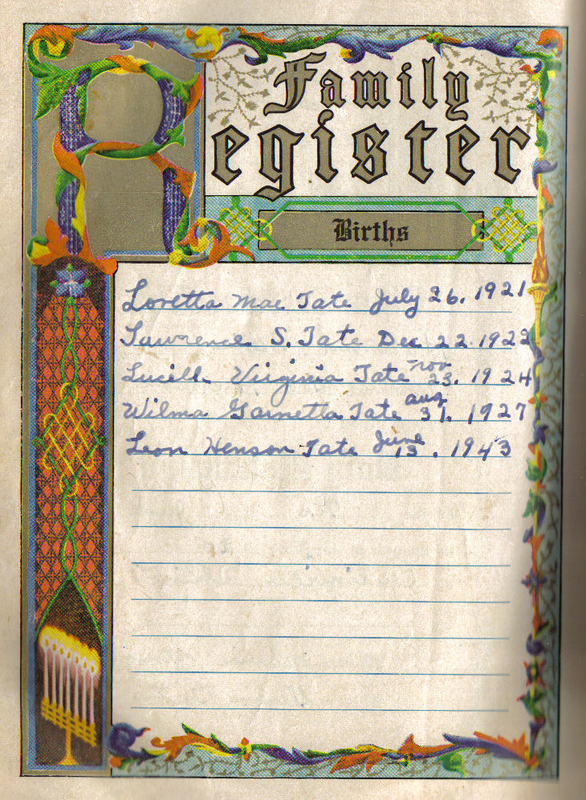 Birth of daughter, Dorothy, 15 Aug 1924 to Robert Jennings and Eunice Smith Rainwater. 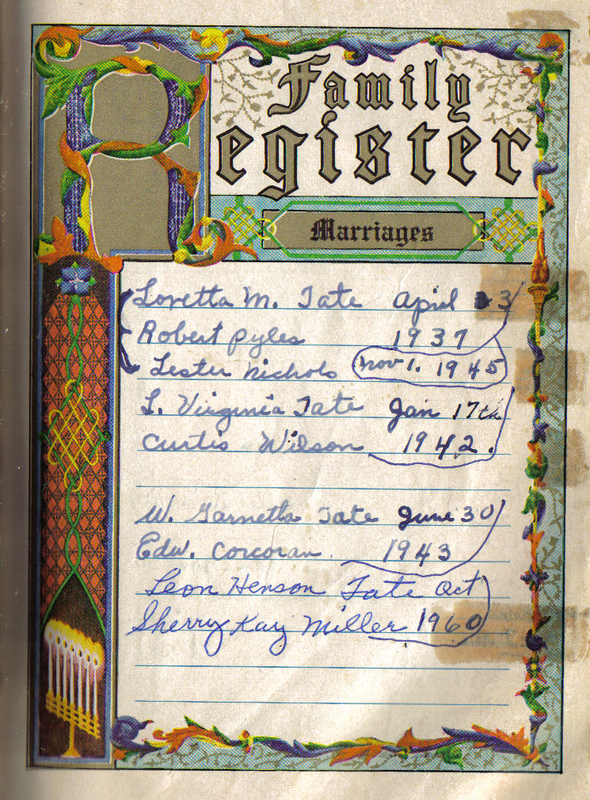 Dorothy Rainwater married W. T. Higginbotham of Hamburg, Ark on 14 Dec 1945 in Crossett, Ark. Rebecca Lynn Higginbotham was born 9 Dec 1951. Lucy Rebecca Rainwater died at Poplarville, Ms at residence of Mrs. Minnie Orr 21 July 1931 - Buried at Shubuta. Clifton Rainwater died 8 Feb 1958 at San Gabriel, Calif and is buried there. Minnie Myrtle Weems died 11 Oct 1961 at Falls Church, Va and buried in Arlington National Cemetery. Jesse Gould Rainwater died 10 Feb 1962 at New Orleans, La and is buried there. 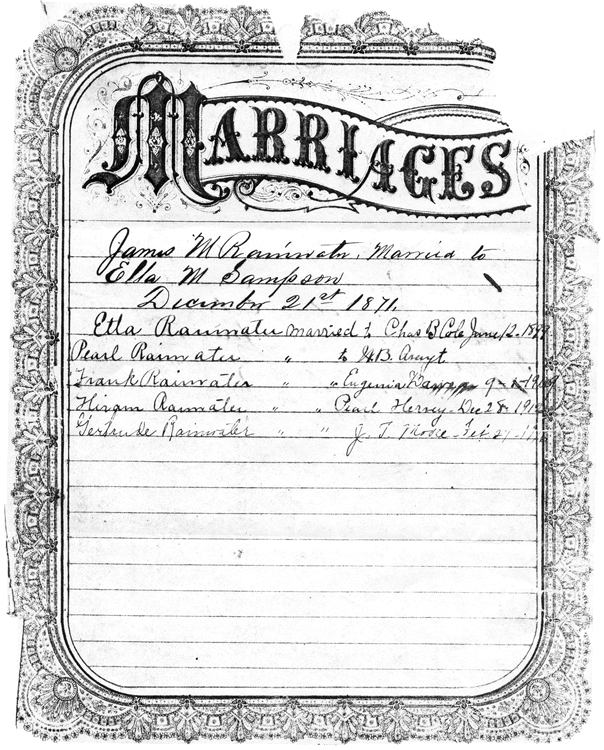 John P. Rainwater and Malinda Buckley were married 30th Nov 1852 in Tex. 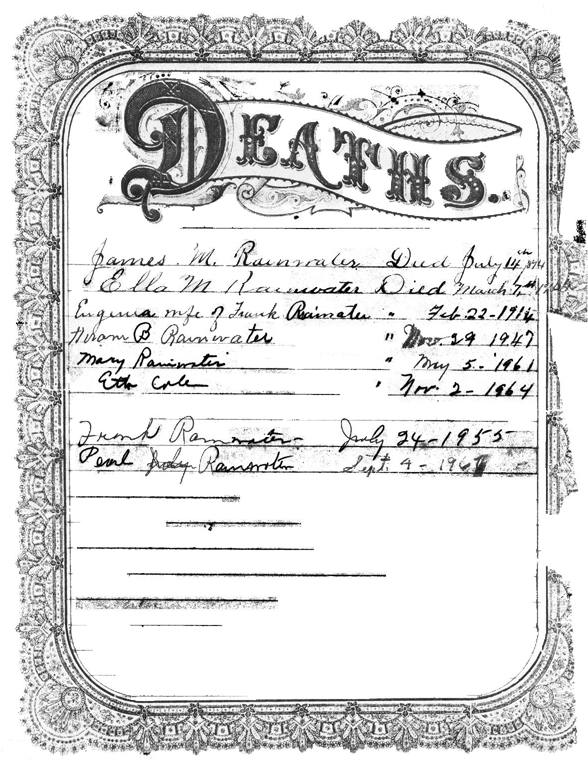 John P. Rainwater died 12th Jul 1900 in Tex. 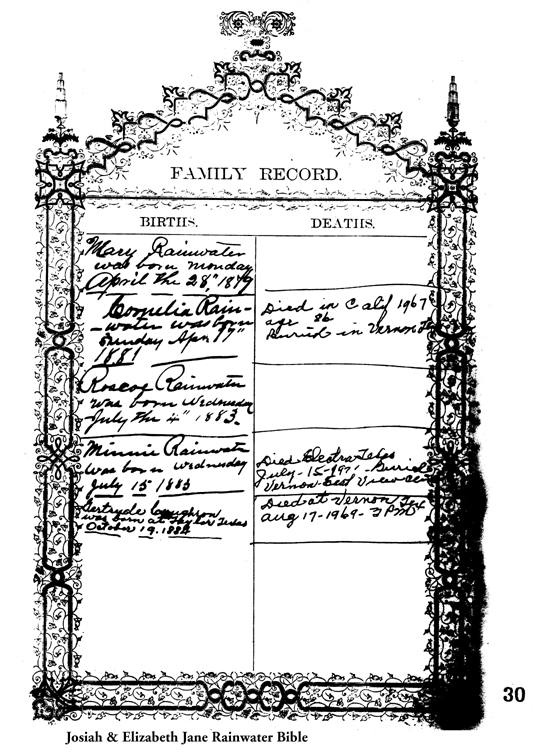 Irene Edith Rainwater born 22 Jun in New Orleans. Jesse Gould Rainwater, Jr. borned in New Orleans 26th Jan 1911. 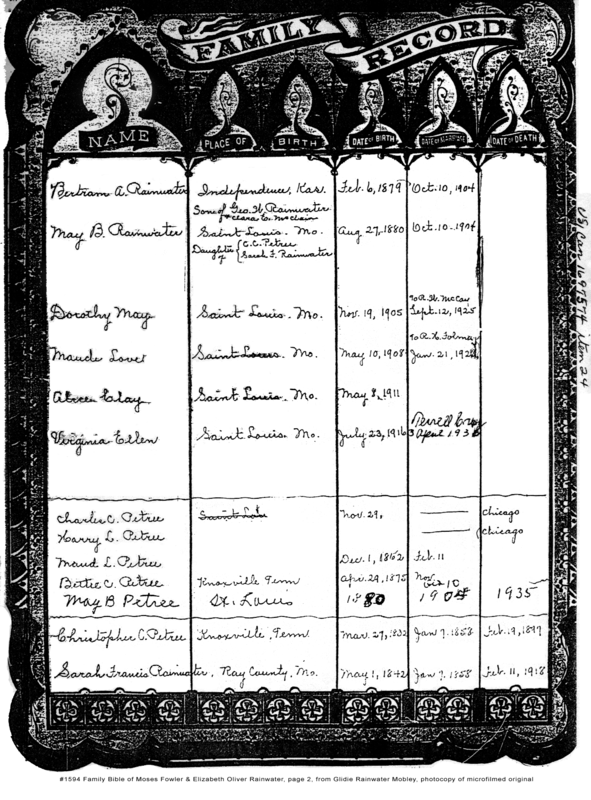 Originally printed in "Mississippi Cemetery and Bible Records, Vol. 10, Sept. 1963" by the Mississippi Genealogical Society. I have excerpted only the portions that bear directly on Rainwater descendants. 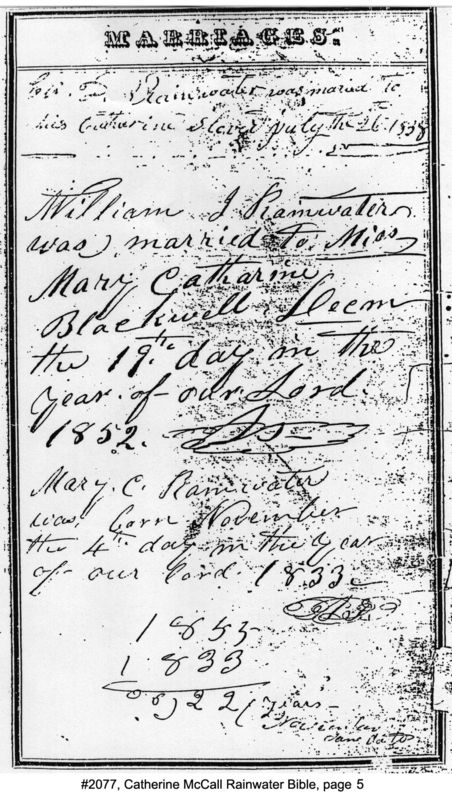 *Either this couple was married after most of their children were born, or the transcription is wrong and this date should be 1802. From "Mid-South Bible Records, Vol. 2, Bicentennial Edition, 1776-1976" printed by the Fort Assumption Chapter DAR of Memphis, Tennessee. It is not a transcription, but an abstract, and it is impossible to determine how much of the information is from the original Bible and how much was added by the individual who contributed the record for publication. 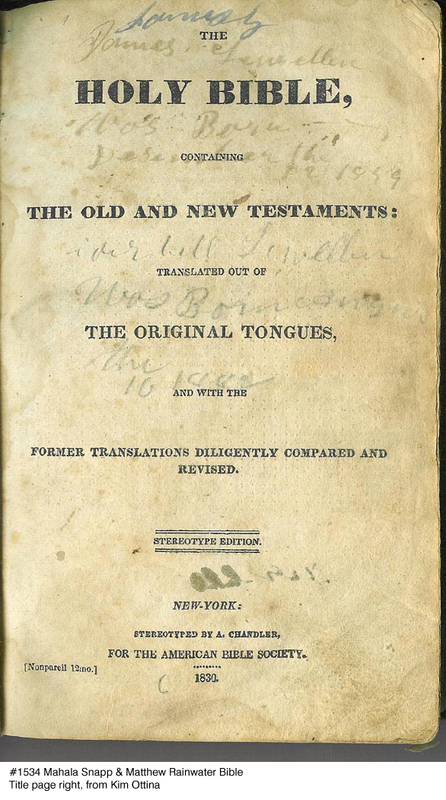 The family Bible was owned at the time by Bertha Rainwater Kent. Bertha Rainwater, born July 25, 1888. Married George Robert Kent on June 3, 1925. Robert Orville Rainwater, born Dec 15, 1890. Died Aug 12, 1967. Married Elizabeth Esther Wilson. Riley Sloan Rainwater, born Nov 28, 1892. Married Virginia Hatcher. Terry Henry Rainwater, born Jan 27, 1895. Died Oct 13, 1954. Married Lena Fender. Juddie Lindsey Rainwater, born Apr 11, 1897. Died July 8, 1966. Married Otis Linden. Elmer Hugh Rainwater, born Jan 31, 1899. Married (first) Opal June Childress. Married (second) Dorothy Nerurt. Nell Rainwater, born April 6, 1901. Married Roscoe Glenn Barger. Charles Clifford Rainwater, born July 10, 1903. Married Louise Stewart. Vera Rainwater, born July 14, 1905. Married Albert George Gunner. Luther Clay Rainwater, born Oct 2, 1907. Married (first) Ethel Thudium. Married (second) Lucille Davidson. 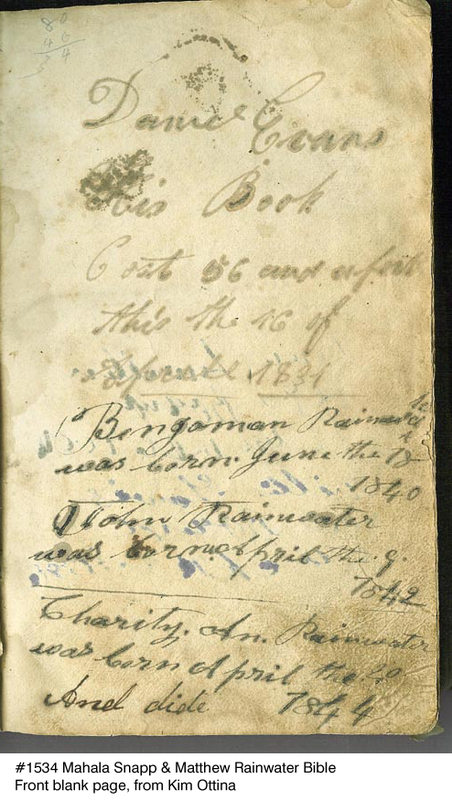 This Bible is presently owned by Micajah Thomas Rainwater. The scans were provided by his daughter, Frances Rainwater Taylor. 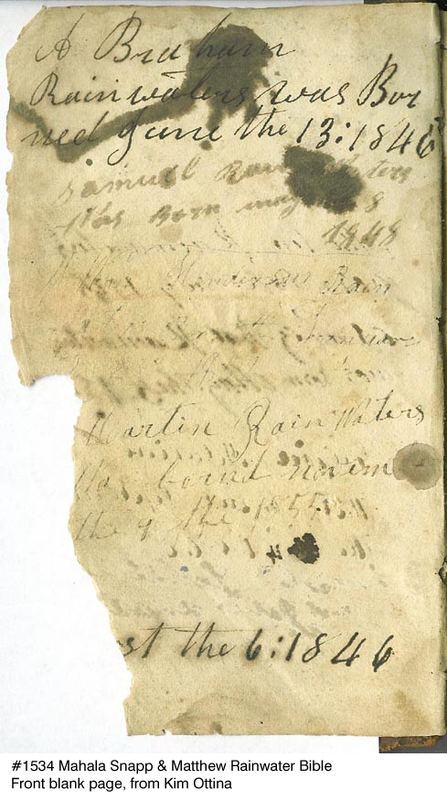 We originally had only a fragment of this Bible, from an affadavit from the Civil War pension papers of John Rainwater, son of Matthew and Mahala Snapp Rainwater. Kim Ottina recently noticed this, recognized the Bible and has donated scans of the original. 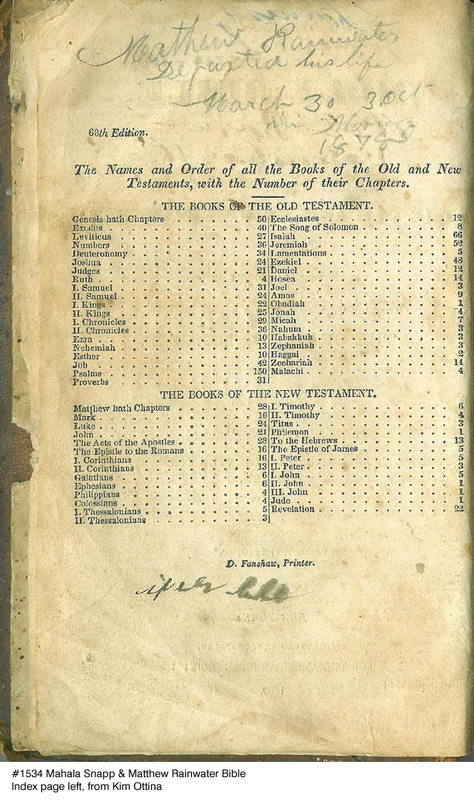 The Bible was originally owned by Mahala Snapp Rainwater, passed to her daughter Susan Rainwater Lewellen, through unknown intermediate generations to Ruth Lewellen Lawson, thence to Raymond R. Lewellen, the present owner. These Bible pages display multiple sets of handwriting. 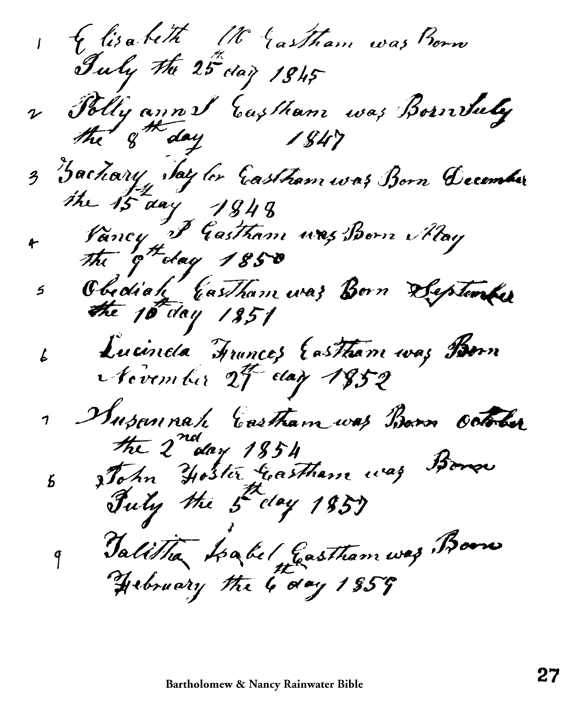 All but the final entry on the Births page were made in the same hand, and appear to be the oldest entries. The entries on the Deaths page were made by three different people. From photocopies of the original provided by William Rainwater. 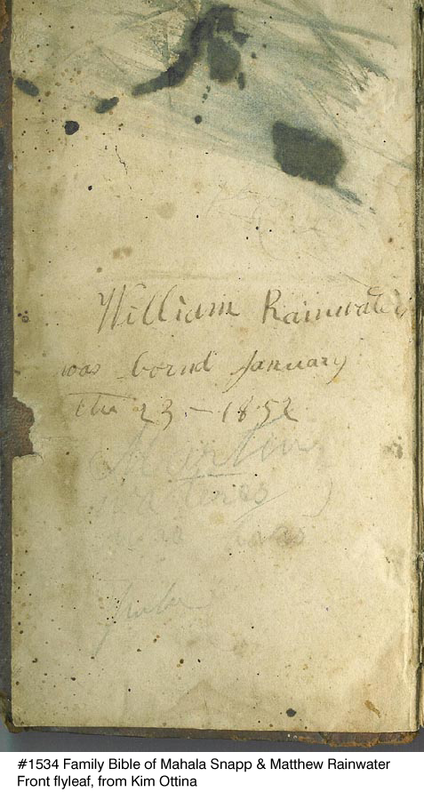 This Bible was last known to be in the possession of the late Hiram B. Rainwater, Jr.
1 The Bible clearly says 1823, but based on the 1900 census record for this individual, should read 1853. 2 Her tombstone says Hervey rather than Henry. From a transcription provided by Raymond Bostick. 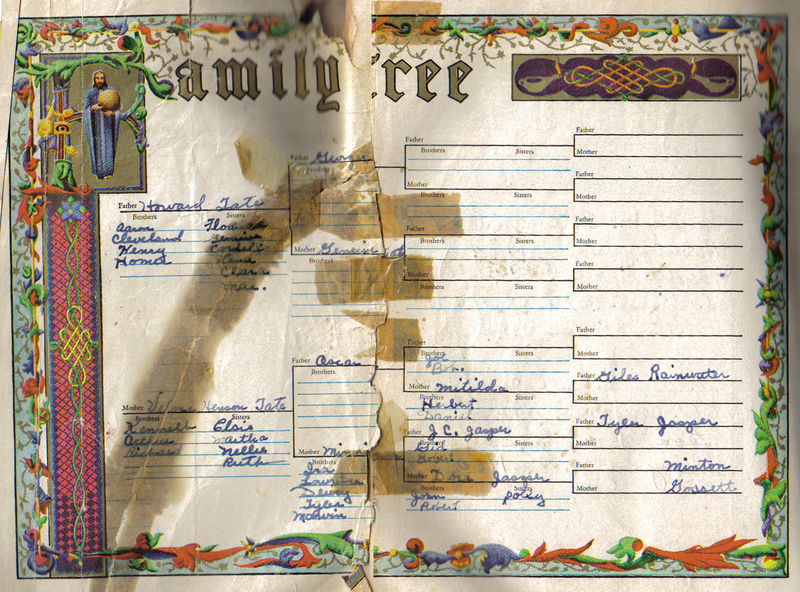 According to Robert Gerstenberg, the family record pages were removed from the family Bible, divided among the decendants, and are now apparently lost. If you know the whereabouts of any of the original pages, please contact one of these two gentlemen, or this website. Photocopies of the original pages were contributed by Glidie Rainwater Mobley. 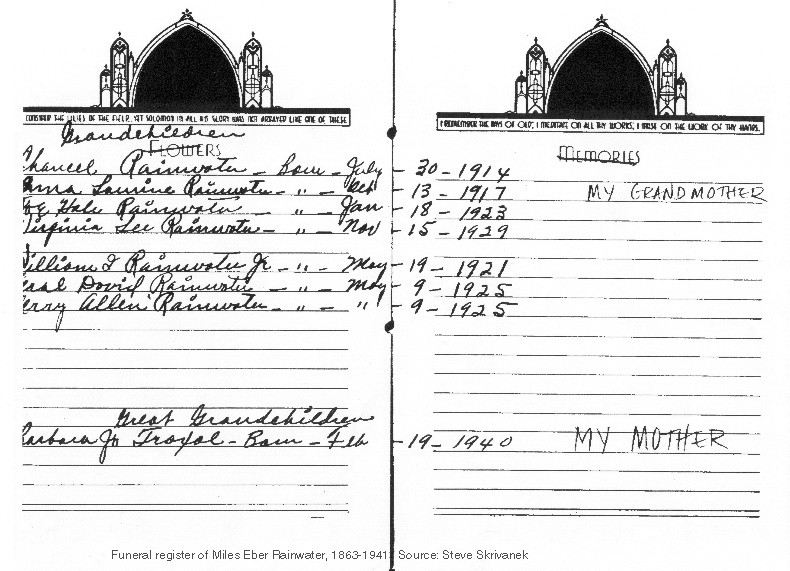 Based on the content, it must have passed to Sarah F. A. Rainwater Petre following her parents’ deaths. A microfilmed copy of this Bible may also be found on US/Can #1697574 item 24. 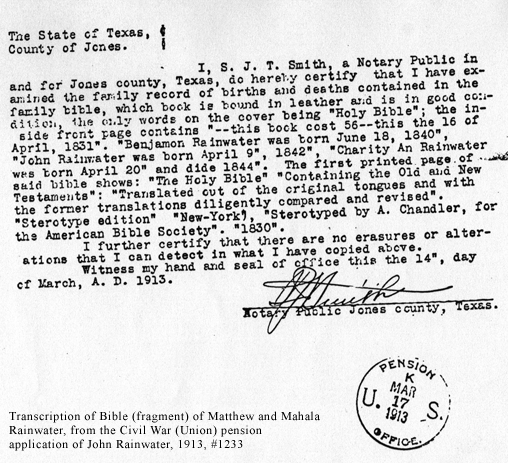 This large Bible is inscribed as the property of A. J. Rainwater. Aaron J. Rainwater, son of Leroy N. and Hannah Smith Rainwater of Georgia, came to Texas prior to the Civil War. He was eventually joined by all of his siblings. When he died in 1892, the Bible passed to his widowed sister, Mary Rainwater Webb. 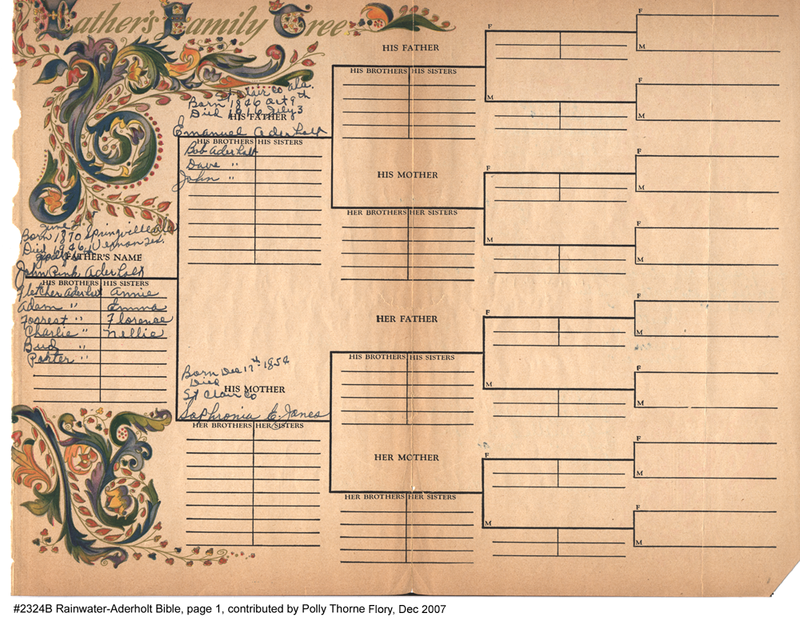 In addition to preserving information about the family’s births, deaths and marriages, the Bible has an unusual photo album section in the back which contains numerous tintypes and photographs. The Bible is presently owned by Mr. & Mrs. James H. Webb, Jr.
Eula Katherine Bush and John Pettus Dunaway, Jul 4, 1924, at Hartselle, Ala.
Ben McCulough Webb and Beatrice ________, Jun 22, 1925, at Los Angeles, Calif.
James Harvey Webb, Jr., and Marjorie Jane Day, Jul 27, 1946, at New York, N.Y. 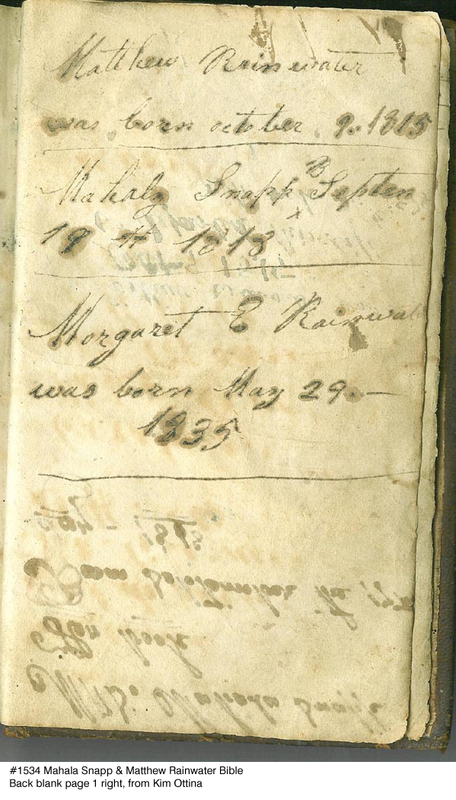 This Bible was given as a gift to Catherine McCall Rainwater, the estranged wife of James Rainwater, by her son, John Sanford Rainwater. 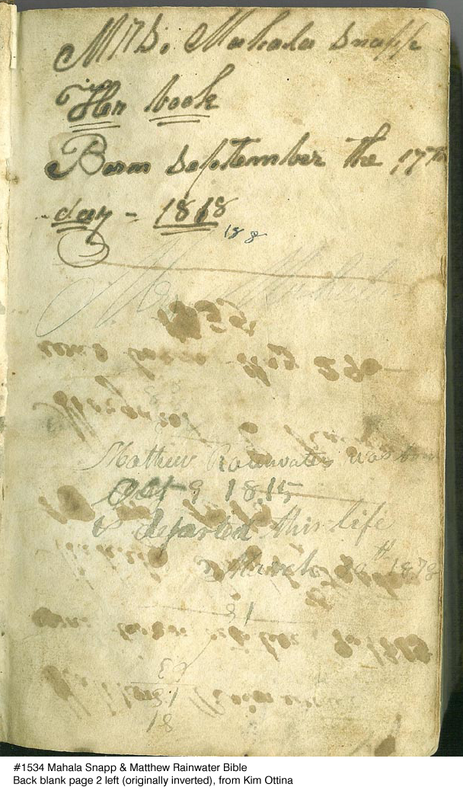 Based on the clues he provides in the flyleaf inscription correlated with other known data, the gift was sent between 1851 and 1870. 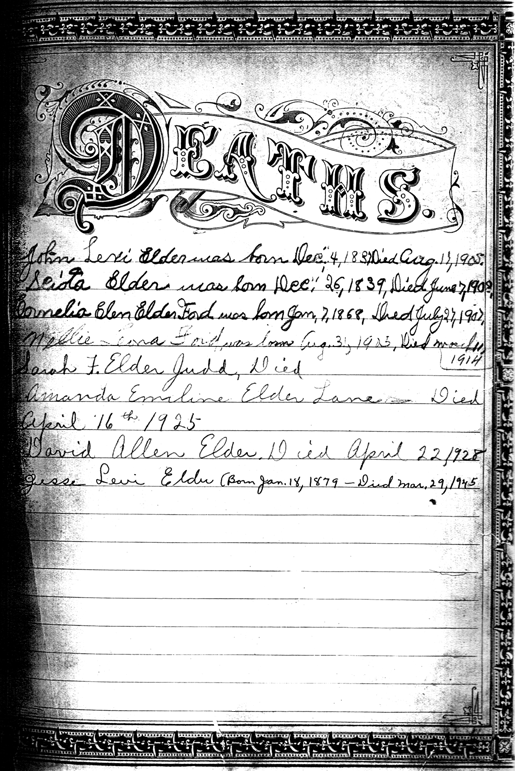 At Catherine’s death in 1875, the Bible must have passed into the hands of one of the children still living in Tennessee, probably the family of William Inman and Mary Blackwell Rainwater. Whether the Bible still exists and who presently owns it, is not known. Photocopies of the original were contributed by Glidie Rainwater Mobley. It would afford me much pleasure to see you once more. Twenty-five years has elapsed since I have seen your face, but mother I have not forgotten you yet. I did calculate to see you this winter but owing to my cotton crop I have on hand. It would be out of my power to come there this winter without losing part of my cotton. And mother, if I never see you on this earth I hope I will see you again in a better world than this. My family are all tolerable well at this time. Father is in tolerable health for a man his age but still remains blind. I have another little girl near three months old. The children are going to school at this time. I will write again soon I think. 1 The original inscription contains no punctuation of any sort, and very little capitalization. I have added this for clarity. 2 There is much controversy about which Scotland is meant. Possible and plausible meanings include the European country, the county in North Carolina, or the town in Halifax Co., NC. 3 Mary Catherine Blackwell, wife of William I. Rainwater. 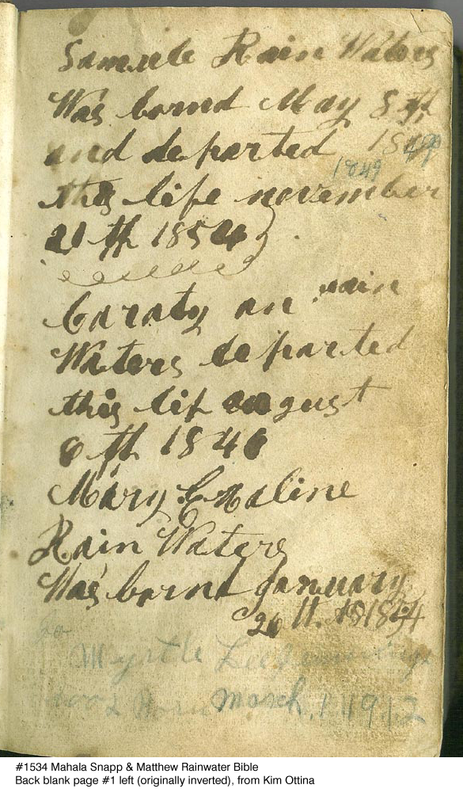 A second birth record is given for this individual on Page 5. 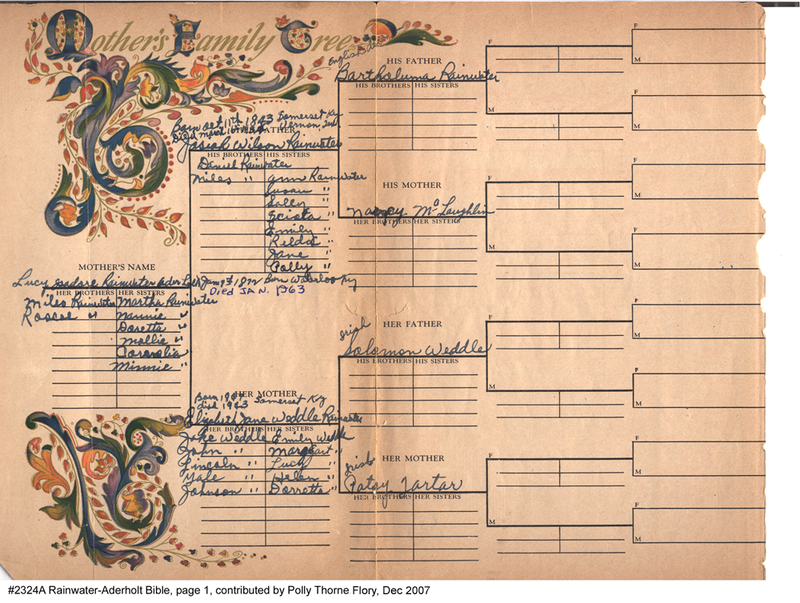 This family record was saved from destruction when it was purchased at an estate sale by Polly Thorne Flory (who is not a Rainwater descendant) and graciously contributed to The Rainwater Collection. Mother’s Father: Josiah Wilson Rainwater, born October 11th, 1843, Somerset, KY. Died March 16th, 1934, Vernon, Tex. Father’s Name: John Pink Aderholt, born June 21st, 1870, Springville, Ala. Died July 6th, 1946, Vernon, Tex. Father’s Mother: Saphronia E. Jones5, born Dec 17th, 1854, St. Clair Co.
5 Jones was the maiden name of Emanuel Aderholt’s 2nd wife. Saphronia’s maiden name was Stone. Velma Henson Tate was the granddaughter of Matilda Rainwater Henson. These scans were donated by Krista Freeman. This record is part of Abraham Butler Rainwater’s 1898 Civil War pension application.